The variegated sea urchin typically lives for about 4 years in the wild. The close-up view shows the sea urchin’s spines and tube feet that regrew after being removed 15 days earlier. Credit: Helena Reinardy (left) and Andrea Bodnar (right), Bermuda Institute of Ocean Sciences. Our eyes are the gateway to countless brilliant sights. However, as evidenced by the images on this page, the eye itself can be breathtakingly exquisite as well. This May, as we celebrate Healthy Vision Month with the National Eye Institute, we hope sharing the beauty hidden in your eyes will inspire you to take the necessary steps to protect your vision, prevent vision loss and make the most of the vision you have remaining. Visit NEI to learn more about caring for your eyes. 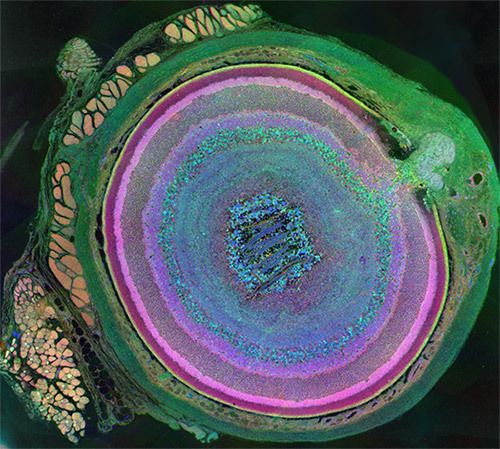 Eyes are beautiful, and they take on a whole new look in this agate-like image, which highlights just how complex mammalian eyes really are. 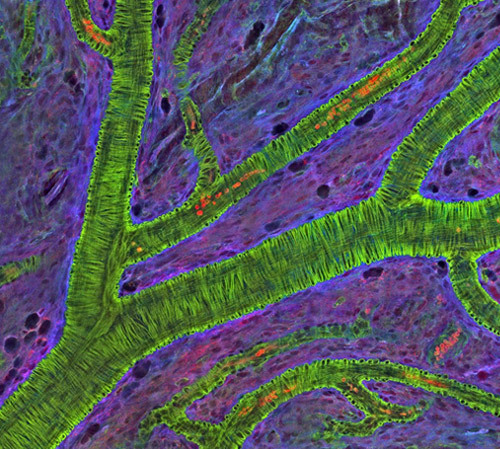 Researchers used staining and imaging techniques to turn each of the 70-plus cell types in this mouse eye a different color. 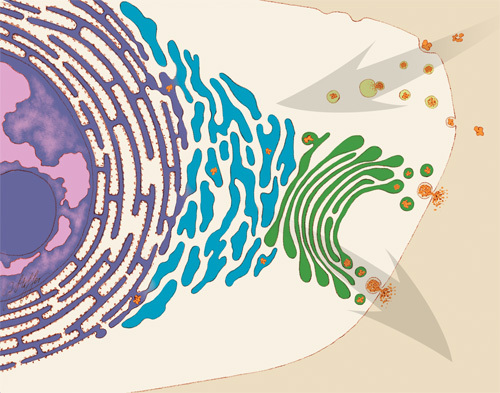 The image won first place in the 2011 International Science and Engineering Visualization Challenge. Credit: Bryan William Jones, University of Utah Moran Eye Center. This burst of starry points is actually part of the retina from a mouse eye. 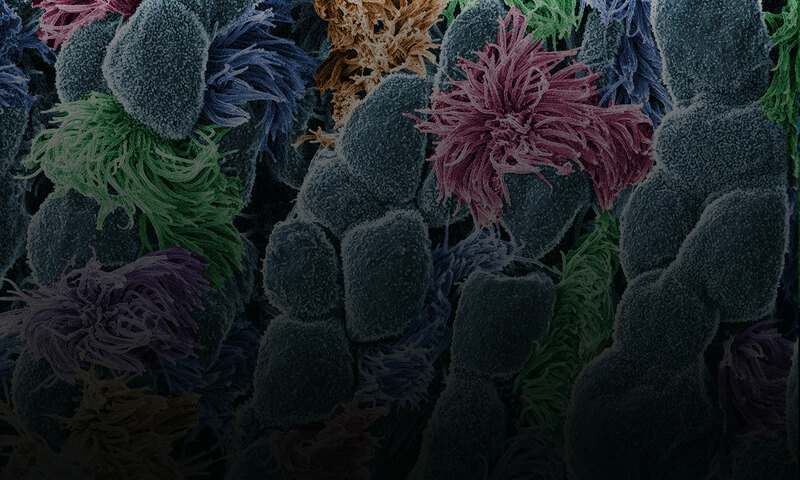 The image comes from a research project investigating the promise of gene therapy for glaucoma. Untreated glaucoma is a leading cause of blindness. The disease is characterized by the death of cells called retinal ganglion cells. 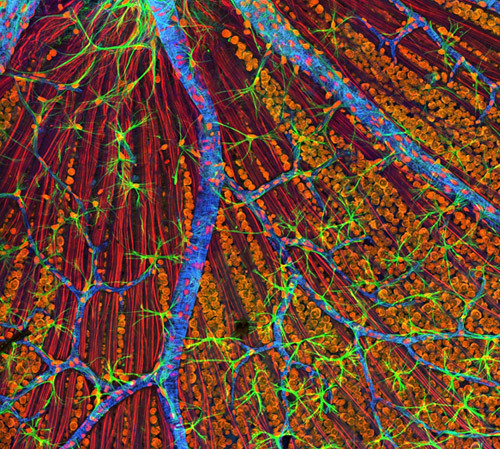 Scientists are hoping to deliver gene therapy to these cells as a treatment for glaucoma. In this photo, a fluorescent protein (GFP) lights up to show the location of retinal ganglion cells—and to reveal how well the proposed gene therapy technique might work. Credit: Kenyoung Kim, Wonkyu Ju and Mark Ellisman, National Center for Microscopy and Imaging Research, University of California, San Diego. What appears as a tree branch painstakingly wrapped in green wire is a microscopic blood vessel from the retina at the back of a mouse eye. These vessels can help diagnose conditions such as glaucoma and diabetic eye disease. The vessels also have a characteristic appearance in people with high blood pressure. This detailed image was created to help scientists understand what happens in a genetic disease called neurofibromatosis, in which tumors begin to form on nerve tissue. Credit: National Center for Microscopy and Imaging Research, University of California, San Diego. 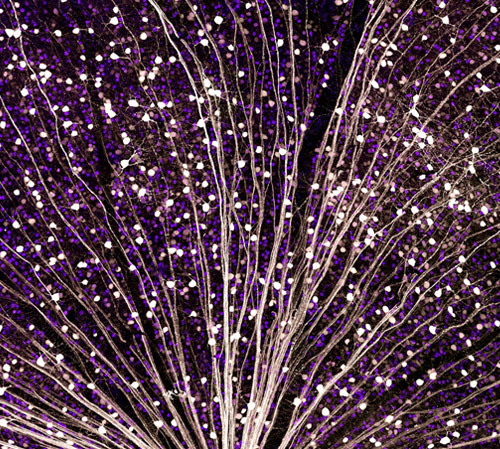 Like a colorful fiber-optic network, this microscopic layer from a mouse’s eye relays information from the retina to the brain. Retinal ganglion neurons (orange) and their associated optic nerve fibers (red) are overlaid with blood vessels (blue) and spidery glial cells (green). By comparing detailed images of healthy eye tissues with similar images of a diseased eye, researchers can learn about changes in biology that occur as eye diseases develop. Credit: National Center for Microscopy and Imaging Research, University of California, San Diego.